Ravi Shekhar, Aashish Venkatesh, Tim Baumgärtner, Elia Bruni, Barbara Plank, Raffaella Bernardi and Raquel Fernández. 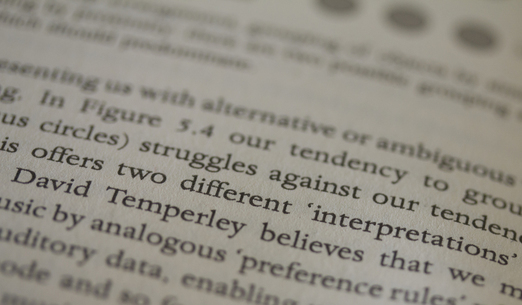 A closer look at jointly learning to see, ask, and GuessWhat. To appear in NAACL 2019. Martin Kroon, Masha Medvedeva and Barbara Plank. When Simple n-gram Models Outperform Syntactic Approaches: Discriminating between Dutch and Flemish. In Proceedings of the Fifth Workshop on NLP for Similar Languages, Varieties and Dialects. COLING workshop, 2018. Katharina Kann, Johannes Bjerva, Isabelle Augenstein, Barbara Plank and Anders Søgaard. Character-level Supervision for Low-resource POS Tagging. To appear in Proceedings of the 1st Workshop on Deep Learning Approaches for Low Resource Natural Language Processing (DeepLo 2018). Barbara Plank. Predicting Authorship and Author Traits from Keystroke Dynamics. In Proceedings of the Second Workshop on Computational Modeling of People's Opinions, Personality, and Emotions in Social Media (PEOPLES). NAACL workshop, 2018. Sigrid Klerke, Héctor Martínez Alonso and Barbara Plank. Grotoco@SLAM: Second language acquisition modeling with simple features, learners and task-wise models. In Proceedings of the NAACL-HLT Workshop on Innovative Use of NLP for Building Educational Applications (BEA), NAACL workshop, 2018. Artur Kulmizev, Bo Blankers, Johannes Bjerva, Malvina Nissim, Gertjan van Noord, Barbara Plank and Martijn Wieling. The Power of Character N-grams in Native Language Identification. To Appear in BEA 2017, EMNLP workshop, Copenhagen, Denmark. Johannes Bjerva, Gintare Grigonyte, Robert Östling and Barbara Plank. Neural Networks and Spelling Features for Native Language Identification. To Appear in BEA 2017, EMNLP workshop, Copenhagen, Denmark. Raffaella Bernardi, Ruket Cakici, Desmond Elliott, Aykut Erdem, Erkut Erdem, Nazli Ikizler-Cinbis, Frank Keller, Adrian Muscat and Barbara Plank. Automatic Description Generation from Images: A Survey of Models, Datasets, and Evaluation Measures (Extended abstract). In IJCAI, 2017 (journal track), Melbourne, Australia. Željko Agić, Anders Johannsen, Barbara Plank, Héctor Martínez Alonso, Natalie Schluter and Anders Søgaard. Multilingual Projection for Parsing Truly Low-Resource Languages. In [TACL], 2016. Olga Uryupina, Barbara Plank, Gianni Barlacchi, Francisco J Valverde-Albacete, Manos Tsagkias and Alessandro Moschitti. LiMoSiNe pipeline: Multilingual UIMA-based NLP platform. In ACL demo papers, 2016. Anders Johannsen, Dirk Hovy, Hector Martinez Alonso, Barbara Plank, Anders Søgaard. More or less supervised super-sense tagging of Twitter. In *SEM, 2014. [pdf] [bib] Received the *SEM best paper award. Barbara Plank, Dirk Hovy and Anders Søgaard. Learning POS taggers with inter-annotator agreement loss. In EACL 2014. [pdf] [pdf from ACL anthology] [bib] Received the EACL best long paper award. Barbara Plank and Anders Søgaard. Experiments in newswire-to-law adaptation of graph-based dependency parsers. In: Magnini, B., Cutugno, F., Falcone, M. and Pianta, E. (eds.) Evaluation of Natural Language and Speech Tools for Italian (EVALITA 2011), Lecture Notes in Computer Science, vol. 7689. Springer, Heidelberg (2012). Shorter version published in working notes of EVALITA 2011, 23-24th January 2012, Rome, Italy. 2012. Barbara Plank. Domain Adaptation for Parsing. Ph.D. thesis. University of Groningen, 2011. Barbara Plank. Improved statistical measures to assess natural language parser performance across domains. In Proceedings of the 7th International Conference on Language Resources and Evaluation (LREC2010), Valletta, Malta, May 2010. Barbara Plank. Structural Correspondence Learning for Parse Disambiguation. In Proceedings of the Student Research Workshop at EACL 2009, Athens, April 2009. Barbara Plank. A Comparison of Structural Correspondence Learning and Self-training for Discriminative Parse Selection. In Proceedings of NAACL 2009 Workshop on Semi-supervised Learning for NLP (SSLNLP). Barbara Plank and Khalil Sima'an. Subdomain Sensitive Statistical Parsing using Raw Corpora. In Proceedings of the 6th International Conference on Language Resources and Evaluation (LREC2008), Marrakech, Morocco, May 2008. Barbara Plank and Gertjan van Noord. Exploring an Auxiliary Distribution based approach to Domain Adaptation of a Syntactic Disambiguation Model. In Proceedings of the Coling 2008 Workshop on Cross-Framework and Cross-Domain Parser Evaluation (PE), pages 9--16, Manchester, United Kingdom, August 2008. Barbara Plank and Khalil Sima'an. Parsing with Subdomain Instance Weighting from Raw Corpora. In Proceedings of INTERSPEECH 2008, Brisbane, Australia, September 2008. Raffaella Bernardi, Diego Calvanese, Luca Dini, Vittorio Di Tomaso, Elisabeth Frasnelli, Ulrike Kugler, Barbara Plank. Multilingual Search in Libraries. The case-study of the Free University of Bozen-Bolzano. In Proceedings of the 5th International Conference on Language Resources and Evaluation (LREC2006), Genova, Italy, 2006. Embedding Distributional Similarity in Tree Kernels for Domain Adaptation of Relation Extraction. Workshop on "New frontiers in parsing and generation", co-located with PhD defense of Daniël de Kok, University of Groningen, April 2013. Effective Measures of Domain Similarity for Parsing. CLIC seminar, Rovereto, Italy. April 28, 2011. Domain Adaptation of Syntactic Disambiguation Models. University of Antwerp. July 23, 2009. Proceedings of the 2012 Joint Workshop on Intelligent Methods for Software System Engineering. Stamatia Bibi, Alessandro Moschitti, Barbara Plank, Ioannis Stamelos. Barbara Plank. Sub-domain driven parsing. Master's thesis, University of Amsterdam, 2007. Thesis supervisor: Khalil Sima'an (Universiteit van Amsterdam), Co-supervisor: Raffaella Bernardi (Free University of Bozen-Bolzano). 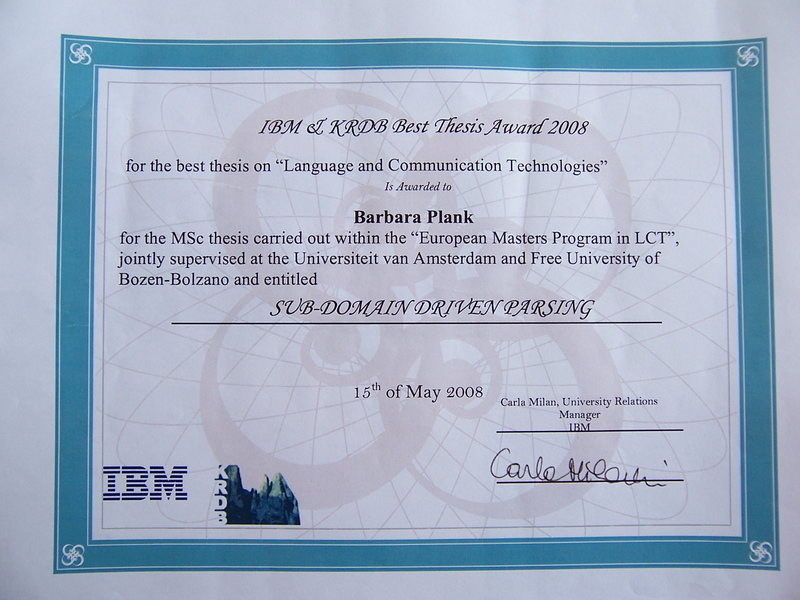 Received IBM Italia & KRDB Best Thesis Award 2008 - for the best thesis on Language and Communication Technologies (LCT) - see call and obtained certificate. Barbara Plank. Porting web based applications in mixed environments: An ASP.NET application on the Mono project. Bachelor's thesis, University of Bozen-Bolzano, 2005. Supervisor: Andrea Molinari (University of Trento).